The Perfect Las Conchas HOUSE w/oceanviews! Casa Romantica is a beautifully decorated, two story home, fully equipped with everything you need to feel at home...Toast your margarita or sip your morning coffee from the terazza with wonderful views of the Sea of Cortez. It is a 3 bedroom, 2.5 bath, two story home located in safe and secure Las Conchas. 24 hour security and drive by neighborhood patrol. Just a quick five minute walk to one of the longest most beautiful, clean and quiet beaches your will ever visit. Enjoy & relax inthe warmth of the sun, surrounded by soft sand and blue water. We live and work in Palm Springs, CA. and love to spend our free time exploring Mexico, enjoying the beautiful beaches, eating the best shrimp and freshest seafood available and boating in the Sea of Cortez. Las Conchas is quiet and has 24 hour security, it is gated and they patrol by our house every few hours. On the beach, enjoy a freshly peeled mango, relaxing message or horseback ride on our clean and peaceful shores. We have much less vendors than Sandy Beach, much less noise, very family friendly and perfect for swimming. GREAT VALUE! For basically the same cost of a condo you can rent our entire home with generous space and much more privacy. Park two cars or trucks in driveway, space for a trailer. We are two blocks from neighborhood beach access path, walk in 5 minutes. If you have a lot of beach toys like me, just drive and park your car right at the access path for easy loading. Casa Romantica has beautiful, comfy beds and all the finishing touches to make you feel at home. Furnishings are a step above the typical beach rental. 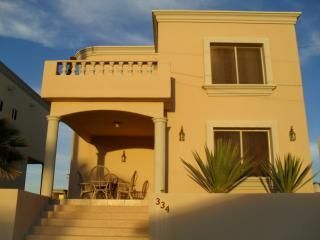 The terraza is very private and all bedrooms have views. Roof top access for 360 views of the ocean and estuary. Stargazing at night and at certain times of the year see and hear the whales breaching in the waters before you! 2 Showers, no tubs. There is a third bathroom - 1/2 bath downstairs with sink and toilet. We supply one set of towels per guest. Please bring any additional towels you may require. We have a mini split down stairs, the remote for that unit is on the credenza in the dining room. We have central AC/heat upstairs, control is in the upstairs hallway. We supply one set of sheets per bed. We do not provide back up sheets. Call for assistance. Access to washer is for long term renters only. Our fireplace is for décor only, please do not burn anything but candles here. Free internet, code on back of router. We supply one set of towels per person. The house sleeps 5pp. We have ice trays, not automatic ice maker. Dining area seats 6, but the table is very large and could accommodate 8. We do not have a BBQ grill at this time, but please feel free to bring your own portable grill. We do have a TV with DVD in the livingrom and a TV with a Chromecast device in the third bedroom. No cable. DVD and DVD library in livingroom. Some books and magazines are in the living room. We have a beautiful balcony upstairs with views of the ocean and also roof top access. Please use with caution. We have some chairs, no loungers. Back porch has a large table. Stairs at entry and to second level. 2 minute walk to the beach, gorgeous views, lovely home. Owner was easy to work with. Overall would stay again. This was a lovely home in a very nice and private community. My family and I loved the location and we felt very safe. The beach was beautiful with easy and endless walking along the shore line. The home was very close to the beach - just a short walk. The home had a lovely deck/patio that provided beautiful views of the ocean and nice afternoon sun. The rooms were spacious, and with 6 adults - we were very comfortable!! Thank you for a lovely stay! - The home information noted a washer available for use, but we could not find one? - The TV was missing a cable so it was not usable. We did not want to watch TV anyway, just wanted you to know. Beautiful new addition to the property! Thank you Ed and Lisa! Such a beautiful house, we fit 12 perfectly and the house is extremely clean. As soon as you open the door there’s a fresh smell to the house I will definitely come back to this house is available, Ed was helpful all the time through messages or calls. It was the first time for me and my friends going to rocky point by ourselves, so is really easy to get to the house; the beach is close, we didn’t drive more than 10 minutes to get to most of the places. Clubs, restaurants, el malecon, everything’s close to the house and security was perfect as well. The house is perfect for everyone if you’re going with friends you’re close to all the fun but also if you’re going with family las conchas is the right place everything’s quiet and safe. Thanks Ed for all your help and we will come back for sure! Great house to stay! Just spent our family vacation in this beautiful house. It had all the things we needed to make our stay comfortable. 5 minute walk to the beach. We definitely stay again! Thank you! Short one hour drive from the border, police checked and patrolled for your safety. Clean facilities for gas, groceries and bathrooms at Circle K. Get away from those noisey condos and those annoying vendor on Sandy beach. Come to Las Conchas and enjoy what will seem like your own private beach - welcome to heaven! Two minute walk to the beach, fishing, boating, snorkeling, diving...10 min drive to the Newly Renovated Malecon (Old Port) fantastic food, music and festivals...great seafood!!! In a safe and secure Mexican beach town one hour from the US border and three hours from the outskirts of Phoenix. Contract will be emailed, once filled out and returned payment will be taken by credit card and keys and map will be mailed.